NOTE: You must have Shearwater Desktop 2.3.8+ to perform this update. Save the above .zip to your desktop or laptop computer. In Shearwater Desktop, go to Dive Computer > Update Firmware... and select the firmware .swfw file. On your Petrel, navigate to Dive Log > Upload Log and wait for the 3 minute countdown timer to begin. Go back to Shearwater Desktop and click the Start button. Smart Ready Bluetooth (to add support for iOS devices). A single firmware file and version number will be used for both the Petrel 1 and Petrel 2. All new features will apply to both models, except those related to the hardware differences listed above. NEW FEATURE: Tilt compensated digital compass. Accessed by pressing the right button once. Calibrate the compass, using the “System Setup > Compass” menu, before first use. NEW FEATURE: Bluetooth Smart Ready for Apple iOS device support. The Bluetooth Smart Ready module supports both Bluetooth Classic (v2.1) standard and the new low energy Bluetooth Smart (v4.0) standard. CHANGE: When surface pressure is less than 960 millibar, now forces the use of auto altitude setting (i.e. cannot use the SeaLvl setting). This does not change the saved setting. 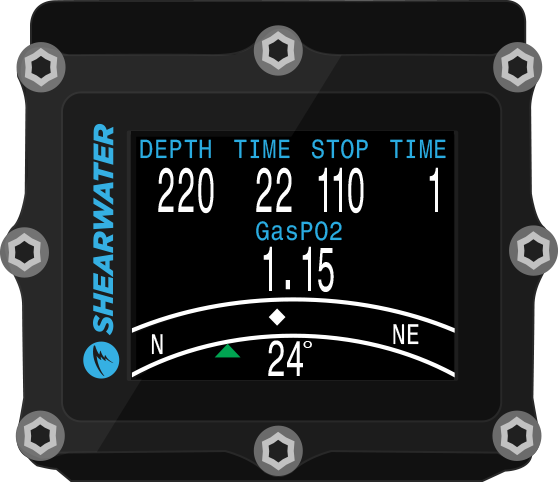 The dive planner now inserts ascent legs in the results table to perform gas switches during the initial ascent to the first deco stop. The decompression calculations always included these switches, but the planner results were only showing a single ascent to the first deco stop using the bottom gas. 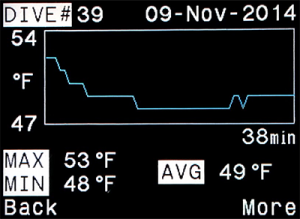 This change results in more accurate gas usage results for some dives. External PPO2 monitoring is now supported for 2 sensors (previously only allowed 1 or 3 sensors). Access the 2 sensor mode by performing a PPO2 calibration with only sensors #1 and #2 connected (single sensor mode accessed by calibrating with only sensor #2 connected). 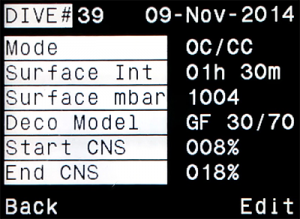 When using the 2 sensor mode, a configurable value may be displayed on the right side of the screen. If sensors within 20%, voting passes and the average PPO2 of the two sensors is used for decompression and CNS calculations. If the two sensors differ by more than 20%, voting has failed. 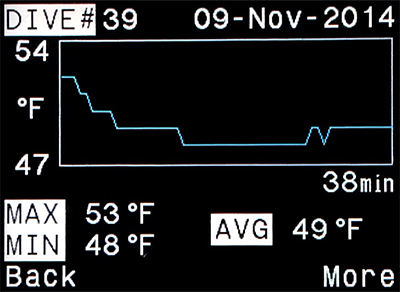 Failed sensors are shown in yellow (unless below 0.4 or above 1.6, then they will be shown in red). PPO2 display will alternate with the message “VOTING FAILED”. The lower PPO2 value will be used for decompression calculations. The higher PPO2 value will be used for CNS calculations. There are updates and changes for Petrel 1 and Petrel 2 in V27. Please refer to the release notes on our website. Is possibile to update hardware from Pertel 1 to’ Petrel 2 for compass ? I am sorry but we are not offering an upgrade option because the price we would need to charge would be higher than the cost difference of selling the older Petrel and buying a new one. Would it be possible to add 2 additional markers in the compass view (Petrel 2) in addition to the green heading and the red marker for the opposite direction: one extra marker at -90° and another one at +90° of the heading? This would be perfect for diving in a square in dark waters. The markers could be in blue and for example have a symbol “” to indicate +90°. I see the example of the symbols are gone. Here they come again: The markers could be in blue and for example have a symbol “less than + minus + pipe” to indicate -90° and “pipe + minus + more than” to indicate +90°. No I am sorry but the Smart Ready Bluetooth for iOS is only available in hardware 2.4.0 and higher. The older versions have Classic Bluetooth which connects to Mac, PC and Android. I have read that it is not possible to upgrade the compass for Petrel 1. When would it be possible to get free upgrade? The new petrel 2 is actually cheaper then the Petrel 1. I actually have 2 myself and I will believe to keep your clientele you would want to create a free upgrade. Hi I just found out about the compass. I agree with the last comment the Petrel 2 is not more expensive than the Petrel1. How do you expect us buyers of the former version (btw. bought in 2014) to sell it for a decent price? Its not old, but now it is, and it wasnt cheaper than the new one. I am desperate for a digital compass, meaning I really want it. Please make an upgrade possible! Doesn’ t have to be for free, just possible.